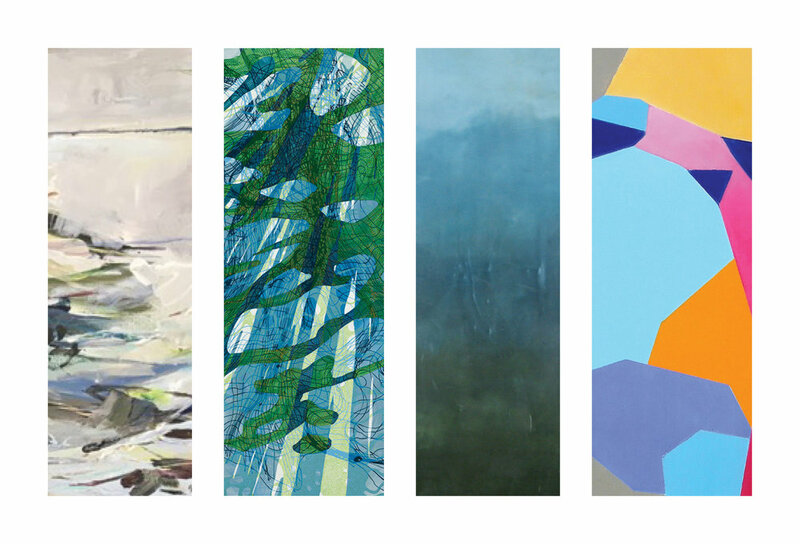 13FOREST Gallery is pleased to present Gesture, an exhibition featuring the work of Linda Cordner, Jeffrey Fitzgerald, Susan Richards, and Lynda Schlosberg. Manipulating the unique properties of wax, Cordner creates hazy fields of color that give the impression of landscape and sky perceived through the lens of memory. Fitzgerald opts for dynamic brushstrokes that evoke the energy and vitality of the land and sea, while Richards simplifies the form of rocks and minerals to vibrant color and graphic shapes that capture their underlying geometry. Schlosberg's paintings burst with flowing forms and undulating lines that visualize the waves of electromagnetic energy that fill the space around us. The works in this exhibition are assembled to demonstrate ways in which abstraction can be used to manifest unique perspectives while still gesturing towards physical reality. Linda Cordner grew up in Connecticut and studied fine art, with concentrations in graphic design and painting, at the University of Connecticut. She works out of her studio in Boston, Massachusetts. Cordner is drawn to wax and its tactile qualities, as the smell and viscosity of the medium are very different from other painting techniques. Coming from a background in graphic design, Cordner is drawn to certain color schemes and shapes, the repetition and placement being important to the composition. Her paintings are made by layering multiple coats of wax which can completely obscure the underlayers at times. She then scrapes away areas of the wax to expose the compositions below. Jeffrey Fitzgerald grew up in Lawrence, Massachusetts, but spent his summers in Maine, where he lives today with his wife and two children. Fitzgerald pursued painting at University of Massachusetts Amherst, where he studied under Walter Kamys, a second generation Abstract Expressionist. As a boy, Fitzgerald found solace and confidence in drawing and rendering. After becoming a father his landscapes became more grounded, with a focus on local colors. Currently Fitzgerald works towards harmony between the process and the subject. The physicality of paint and the passion of the subject matter push his work forward. Susan Richards graduated from Carnegie Mellon University with a BFA in painting. Her professional career has focused on conservation and education in the arts. Most recently Richards has been in solo and group shows at the Kingston Gallery in Boston, the Nave Annex, and the Danforth Museum. Richards' work in this exhibition is a continuation of an exploration of the process of abstraction and interaction of color. 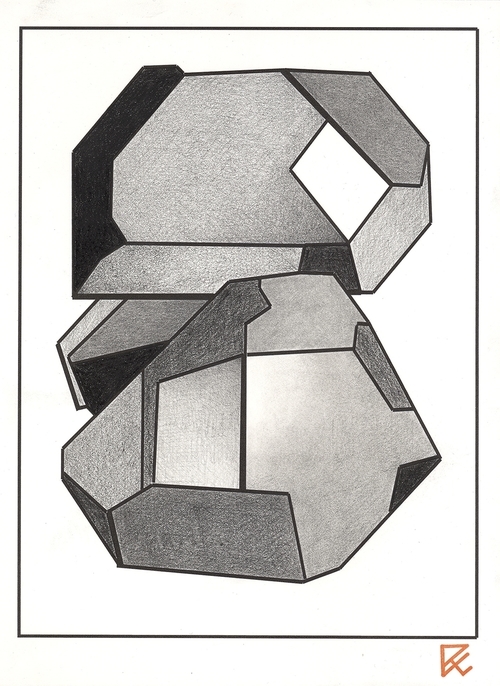 She simplifies realistic images of rocks and minerals through diagramming and using intuitive color choices. The images become a visual puzzle, familiar in feel and yet open to a variety of interpretations. Lynda Schlosberg received her BFA from Ohio University College of Fine Art in Athens, Ohio and went to the Art Institute of Boston at Lesley University for her MFA. She works out of her studio in Waltham, Massachusetts. Schlosberg's paintings use sources from computer animation, a technological process of fragmentation, and the language of abstract painting to depict a non-verbal, non-physical environment. In these paintings line and geometry are woven together, constructed of thousands of tiny brushstrokes of opaque, saturated colors. Individual marks are instantaneously absorbed back into the collective, representing a never-ending cycle, where energy vibrates into form and form breaks down into indiscernible particles of energy.